Stingrays are docile marine animals that only strike their victim when provoked or startled. Lower extremity and foot envenomation is common when fishing in shallow waters off the beach. The stingray tail has a sharp, serrated barb along the proximal third of the tail that is usually hidden and encased in an integumentary sheath and can deliver painful enzymes causing tissue necrosis. Immediate treatment including rapid cleansing and heat submersion of the foot is recommended after injury. If treatment is delayed, infection from marine bacteria often requires hospitalization including intravenous antibiotics and surgical treatment. Stingray envenomation of the foot is a common marine injury. There is an estimated 1500 stingray injuries reported annually in the United States. Usually, a person will be fishing in shallow water and accidentally step on the stingray. This causes an instinctive, defense mechanism of the stingray. The tail will lash upward like a scorpion and penetrate a sharp bard in the lower extremity or foot. The stingray tail has a sharp, serrated barb along the proximal third of the tail that is usually hidden and encased in an integumentary sheath. The stinger barb is made of cartilage and the serrations are directed proximally. 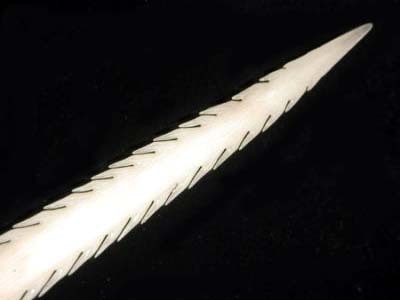 Figure 1 The serrated stingray barb. The barb is encased in an integumentary sheath. The serrated spines are directed proximally and can cause extensive tissue damage when pulled from a wound. 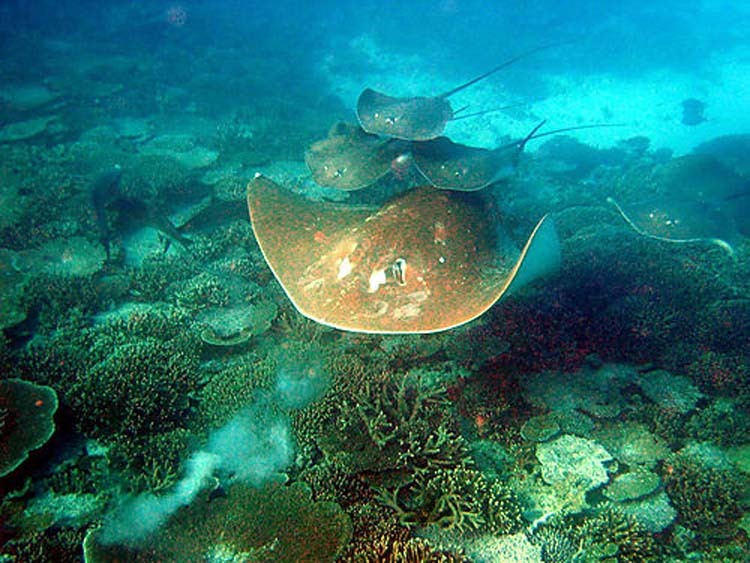 Envenomation occurs in up to 75% of reported stingray injuries. The stingray venom contains the neurotransmitter serotonin and two enzymes; 5-nucleotidase, and phosphodiesterase. Serotonin is responsible for the intense pain associated with the sting and the 5-nucleotidase and phosphodiesterase enzymes cause intense tissue necrosis. Fatal envenomation is extremely rare and has recently come to light due to the death of “The Crocodile Hunter”, Steve Irwin, on September 4th, 2006. Steve Irwin was snorkeling in water and swam close to an Australian bull ray. (Fig. 2) The ray was startled and lashed its tail upward and pierced Steve Irwin’s heart. He died shortly after pulling the barb from his chest. It was reported at that time that only three fatal envenomations in Australia’s history had been reported before Irwin’s death. Figure 2 The Australian bull ray or Southern eagle ray (Myliobatis australis). Interestingly, one month later in October 2006, James Bertikas from Florida was stung by a ray as the barb also pierced his heart. However, he did not remove the barb, and survived his injury. In his case, a 2 ½ inch barb penetrated his left lung and migrated into his heart crossing both the left and right ventricle. Most deaths occur from the actual laceration of a major artery or organ such as the heart from the barb and not the venomous effects. However, in one report, a 12 year old boy died after envenomation from a freak accident when an ‘airborne’ ray slammed against his chest penetrating the barb into the boys left lung and piercing the pericardium. The effects of envenomation are not clearly understood as to reported systemic effects. Common reported symptoms can include diaphoresis, nausea, cardiac arrhythmias,tremors, skin rash, headache,delirium, fever, hypertension, syncope, anxiety and a host of other common allergic reactions. Another complication from injury is the seawater and bacteria that can enter a wound on penetration during this injury. We present the case of a 31 year old male who stepped on a stingray while fishing. He delayed initial treatment, continued to fish and developed cellulitis with a painful foot which required hospitalization and surgical treatment. A 31 year-old male presented to the emergency room with a hot, swollen foot. He was fishing in shallow water the day before and was stung by a stingray. He felt a sharp pain to the top of his foot. He continued to fish most of the day. In the evening, his foot swelling and pain got progressively worse. His wife went to the internet and realized that submerging the foot in hot water would eliminate the pain. He submerged the foot in water and his pain dissipated that evening. In the morning, he had a progressive increase in pain and presented to the emergency room for treatment. 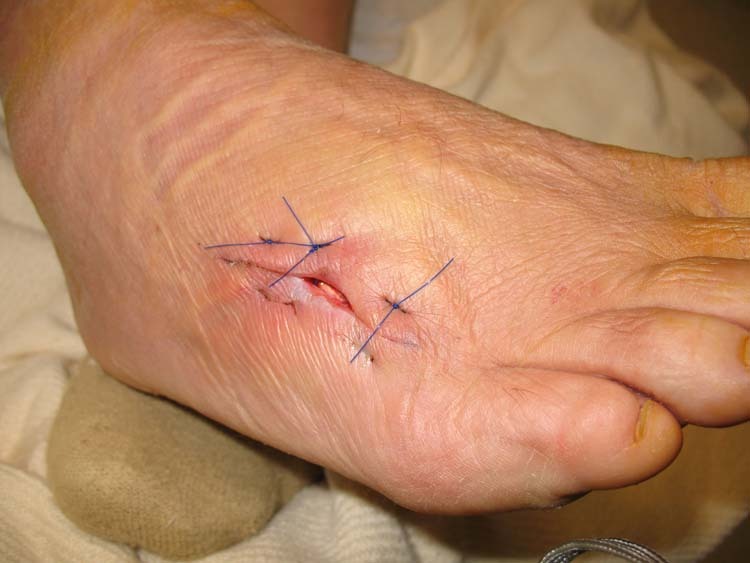 Figure 3 A small puncture wound is see to the dorsolateral aspect of the foot consistent with a stingray envenomation. The central puncture wound will have signs of tissue necrosis. Figure 4 Radiographic evaluation reveals soft tissue gas formation in the subcutaneous tissues of the dorsal foot. No barb is seen on radiograph. It was recommended he go directly to the operating room for incision and drainage with exploration of the wound. Figure 5 It is important to open the puncture site and remove any necrotic tissue and explore for foreign material that may cause continued infection. Necrotic tissue is removed, the edges of the wound can be loosely approximated and the central injury point may granulate and heal by secondary intention. Figure 6 The wound is now closed and the patient has returned to work without incident. It is important to initially submerge the foot into hot water after the incident. Rapid application of heat will denature the enzymes causing the pain and limit the effects of tissue necrosis. It is recommended that immediate submersion into hot, but not scalding, water will also help to ease the pain of this injury. It is recommended to submerge the foot into a water temperature of 42 to 45 degrees Celsius (108-113 degrees Fahrenheit) for 30 to 90 minutes, or until the pain resolves. Infection of the wound can usually be avoided with aggressive wound cleansing and oral antibiotics. In cases where cellulites results in delayed treatment or is not responsive to oral antibiotics, hospitalization and intravenous antibiotics is recommended. 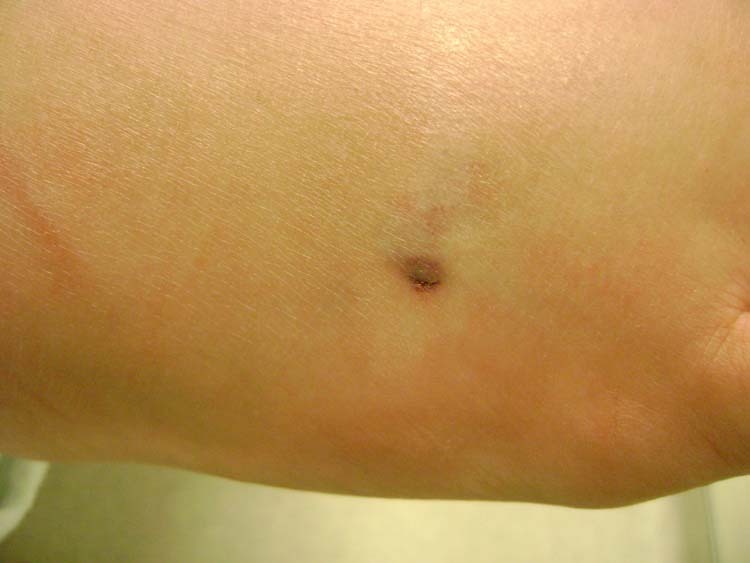 The most common pathogens to infect the wound include Staphylococcus aureus and streptococcus species. Water-borne pathogens of concern include Vibrios vulnificans in salt water and Aeromonas species in fresh water. Stingrays belong the the class Chondrichthyes meaning cartilaginous fishes. These are usually docile creatures that only strike when provoked or feel threatened. In this case, medical treatment after initial injury was delayed which required surgical treatment and prolonged hospitalization. 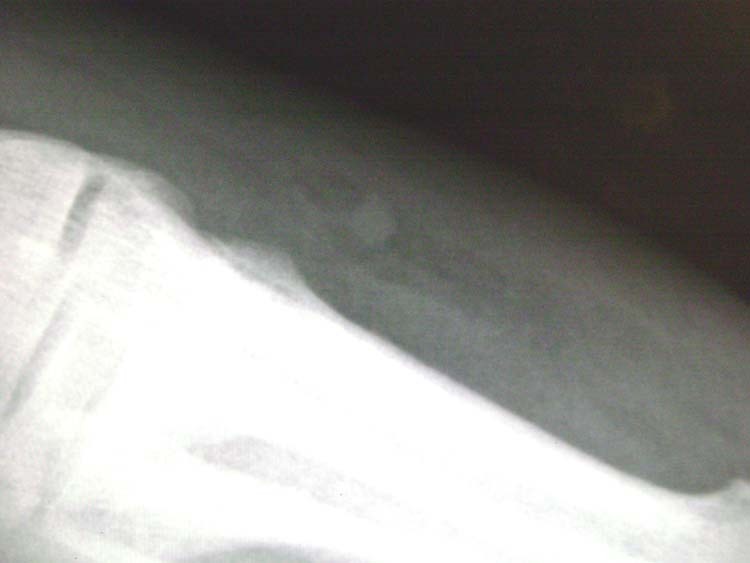 The delay in initial treatment caused progressive tissue necrosis and secondary infection after injury. It is important to treat these injuries promptly. 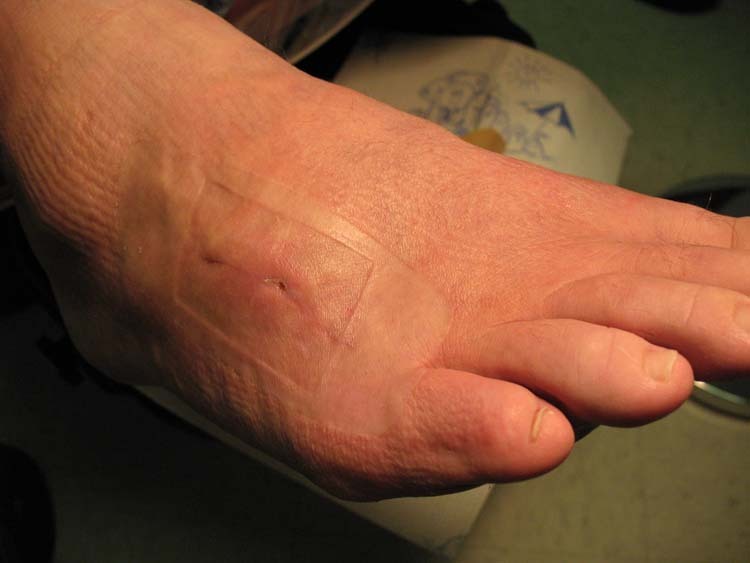 If the injury is not life-threatening, it is important to quickly cleanse the wound and submerge the foot in hot water to deactivate the tissue enzymes that cause pain and tissue necrosis. Ideally, medical treatment will consist of radiographs to eliminate the possibility of a barb that may remain in the wound. In the emergency room setting, the wound can be injected with 1% lidocaine and lanced at the puncture site. The wound should then be aggressively irrigated with Betadine. A calcium alginate dressing can then be applied to the open wound and allowed to heal by secondary intention. Oral antibiotics with coverage for gram positive and negative organisms are prescribed at discharge. 8. St. Petersburg Times [Online news wire], October, 2006.